When I was planning a trip out to Sonoma last fall, I only had a fraction of a day to spend in the area. Since I was going to be visiting Clary Ranch I needed to focus on wineries right around Petaluma. When I called to inquire about Zepaltas wines, I was disappointed I wouldn't be able to make it up to see them since Zepaltas is up in Santa Rosa- just a little out of range for this particular trip. However, they were *so* accomodating in seeking ways for me to get my hands on their wines. They kindly told me of two stores in Petaluma (La Dolce Vita and Vine & Barrel) that carried their product and which wines they'd recently purchased. If that didn't work out, they offered to meet up with me near where my group was having lunch to hand deliver a bottle or two if that would make things easier for me. Now that's service! First of all, if you look at the Zepaltas website I think it's really well done. The site looks clean and distinctive and effectively represents the personality of their brand. Even their newsletters are gorgeous. Follow that up with their label (see image above) which to me says "funky and artistic, but clean". As I recall, the description on the back of the bottle says something to the effect of not wanting to manipulate the wines- to let the grapes speak for themselves and where they came from. Most importantly, all of this aligned perfectly with my impressions of what was in the bottle which was awesome wine goodness. It's really hard to line up a company's image like this, and I'm really impressed with the way such a small winery has done such a fine job. To a skeptic, wine marketing can seem like a bunch of nonsense intended to bamboozle the customer. My view on this is that the whole package is important when deciding where to spend your wine dollars, and I appreciate that the product within the bottle was accurately represented by their marketing. Well done. 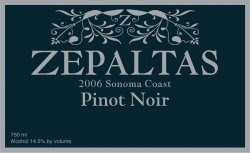 I first became aware of Zepaltas after reading the 2007 Wine Spectator article "The Hot New Dozen of California Pinot Noir" (Wine Spectator subscription required). That piece also featured Clary Ranch (who I've detailed in a 3-part interview with Paul Clary starting here) and another I'm seeking to discover more about: Black Kite. The 2005 Zepaltas Pinot Noir Sonoma Coast La Cruz Vineyard garnered the HUGE score of 95 points in that article. Now *that* is a big number. Wow. Since then, they've followed up with favorable reviews from a number of publications. I had this 2006 Pinot Noir Sonoma Coast (that I'm calling my Wine of the Year) with family the night before Thanksgiving. It was a hit with everyone. It is a blend of the grape sources that go into their otherwise single-vineyard productions. In addition to being their most affordable offering at $39, it was also their highest rated 2006 according to Wine Spectator (value!). "I was thoroughly impressed with this wine in every way. Beautiful earthy aromas on the nose. I noticed two things on the palate- first a tart note, then a spicy strawberry aspect. Finally, a big long finish that went on for minutes. Beautiful bottle and really nice people to buy wine from too. Would definitely recommend and will seek out more in the future." The 2006 contains 14.5% alcohol. 103 cases were produced. Here is a follow-on interview with Ryan Zepaltas with questions (as always) from a consumer's perspective. Are you currently a subscriber to the Wellesley Wine Press? If not I'd love it if you clicked here to subscribe via a reader -or- clicked here to subscribe via E-mail. Question of the Day: What was your "Wow" wine of the past year?